Since we are wheat farmers, I’ve been thinking about grinding my own flour. Last year we raised some hard red spring wheat and I thought it was a great time to get started. I saved a 5 gallon bucket of wheat after harvest and researched for the best way to clean it. Come to find out that the best way is an old way. (I’m sure, if Dad were here to ask he would have told me how.) By placing a box fan on a table on our deck and a very large pan below to catch the grain, I poured the grain in front of the fan and let the air blow out the chaff, bugs, and small kernels. I repeated this a few times and then I had clean grain. Soft white wheat (green dish) – best for making pastries, pies, cookies, biscuits and muffins. The next step was getting a grain mill and the one I decided on was the KoMo Grain Mill. I love it! The electric motor and ceramic milling stones are not too loud when it runs and it does a great job grinding the wheat into flour. It’s ready to use whenever I need flour and it also looks great on my kitchen counter. Making the bread, now this is actually the most frustrating part. The first couple of loaves I made were great, then it went downhill after that. I’ve learned that there are a few tricks and variables in baking bread like, gluten, protein percentages, wheat bran and viable yeast, and yes, the weather and humidity. 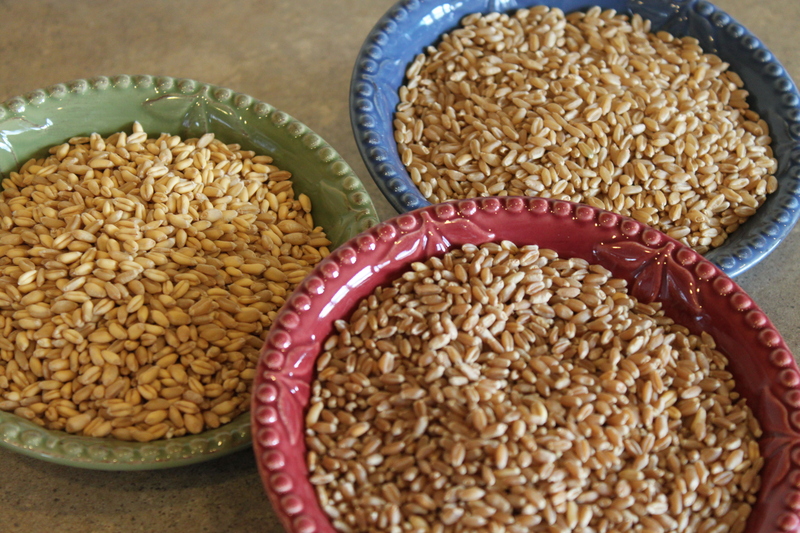 So, I am learning, trying many different recipes and realizing that my supply of hard red wheat is diminishing rather quickly. After several disappointing recipes, I decided to look in my old Sunset Cook Book of Breads and found the basic white bread recipe and tweaked it for whole grain and honey. The family says it is a keeper recipe and I have to agree. So I have included the recipe for you. Please if you have any pointers for me or great recipes, let me know in the comment box or shoot me an email. In mixing bowl, dissolve yeast in water. Add warm milk, butter, salt, honey and blend together. Add 3 cups of flour 1 cup at a time, mixing until flour is evenly moistened. The finished kneaded dough should be nonsticky, and smooth. Put rounded dough in a buttered bowl; turnover to butter top. Cover and let rise in a warm place (80 degrees, I warm the oven and place a shallow pan of hot water on the bottom rack) until doubled, about 1 1/2 to 2 hours. Punch down releasing the air and let rest for a couple of minutes, then knead lightly and divide dough. Form two loaves by gently pulling top surface toward the underside and then pinching a seam in the center and sealing the ends. Butter 2 bread pans and place loaves seam side down and let raise again in warm place for an hour or so. Bake in a 350 oven for 30 to 40 minutes or until loaves are golden brown and sound hollow when tapped. Turn loaves out of pans and onto racks to cool. To make 1 loaf, just half the recipe, except the yeast and water. Add 1 TBS of vital wheat gluten per cup of whole wheat fresh ground flour. That bread looks very impressive. Way to go – must feel very fulfilling to start from scratch and make such great looking bread. Have you tried using that flour in any other baking?? Those loaves look beautiful! YUM! 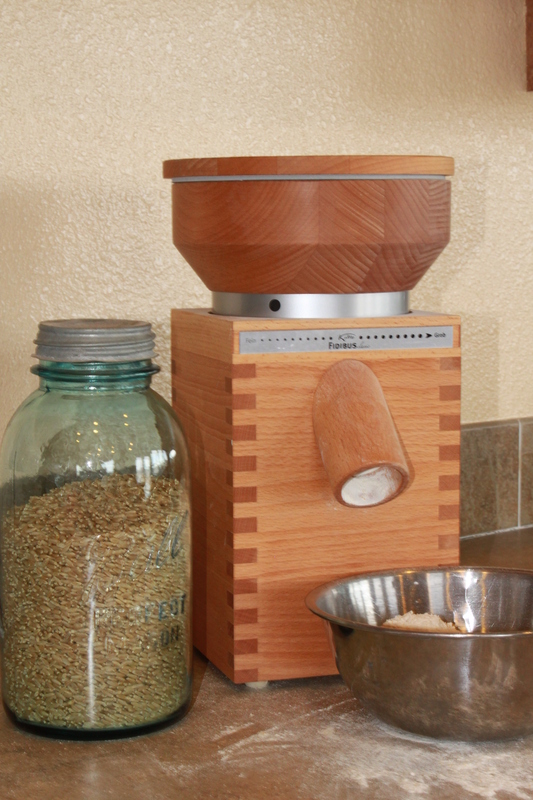 And that grain mill is beautiful too! Looks great on your counter. I think this is an awesome post – I adore making bread. Sharon, yes, I’ve been pretty much using just the flour I grind. I use the soft white wheat and sift out the bran for cookies. I still have some store bought flour in the cupboard and use it if I need small amounts. Ugh your blog is great! Makes me miss you even more! I wanted to share a tip i learned when making bread dough in 60 pound recipes. Take a golf sized ball of dough and gently pull and stretch the dough apart….it should become a very thin membrane without holes- that is when you know the gluten has been developed enough. Thanks Rhonda, I will try the stretching the dough next time I make some bread. Do I keep kneading if it’s not thin with holes? If the dough does not develop holes when you pull it, it is ready to rise. If you are getting holes, it needs more kneading.